The holidays are my favorite time of year. November and December are filled with amazing food, fun times with loved ones, and so much cheer. Yet, the holiday season often comes along with skin issues. Dryness, redness, and irritation run rampant in winter. But, fear not! We’ve rounded up our favorite holiday skin care tips so you can focus on the celebration! Our number one holiday skincare secret is skin prep. If you’ve got a lot of events on the horizon this holiday season, chances are you’ll be wearing a lot of makeup. Getting glam and beautified is part of the fun! I love laying all of my makeup favorites out on my vanity and taking my time getting ready. The very first thing I do is moisturize. Applying a good face cream makes for a smoother makeup application! Our Moisturizing Face Cream is perfect for skin prep and can even replace your primer. Yes, it’s absolutely tempting to crawl into bed right after a party and not worry about washing up. We’re all guilty of it. But, keeping your makeup on overnight opens the door for a host of skin issues. I’m talking breakouts, irritation, and dryness. Stashing makeup wipes in your bedside table lets you get the best of both worlds! If I had a dollar for every time I overdid it during the holidays and my skin paid the price, I’d be rich. It’s never fun to watch your diet, and the holidays should be a time of treating yourself. Moderation is key. Gorging on sweets and forgetting about protein and veggies will lead to breakouts. Remember: you can enjoy yourself without overdoing it. Hydration is key to healthy skin. Drinking your 8 glasses of water flushes toxins out of your body and helps combat winter dryness. If you’re planning on indulging in a couple of drinks while at a party, make sure to increase your water intake. This prevents further irritation and keeps your skin happy. If you have a skin condition, you already know the importance of dressing in breathable layers. This is especially crucial during the holidays. It’ll be cold outside, but warm inside, so layering lets you easily transition between temperatures. Another thing to consider when getting dressed is redness. If your skin is flushed or you have rosacea, we recommend steering clear of red clothing. Wearing a red dress or a red sweater can bring out the redness in your face. Green is just as festive and won’t bring attention to any red areas! Winter is the season of chapped lips. Lip balm is the perfect choice for keeping your lips moisturized and smooth. We suggest using one that contains SPF. Stress does a number on your skin, and the holidays can be incredibly stressful with all the gift shopping, cooking, and party planning in the mix. Taking a little me time is absolutely crucial. Indulging in a spa day, meditating, or going for a quick walk gets your mind off your to-do list and lets you breathe. 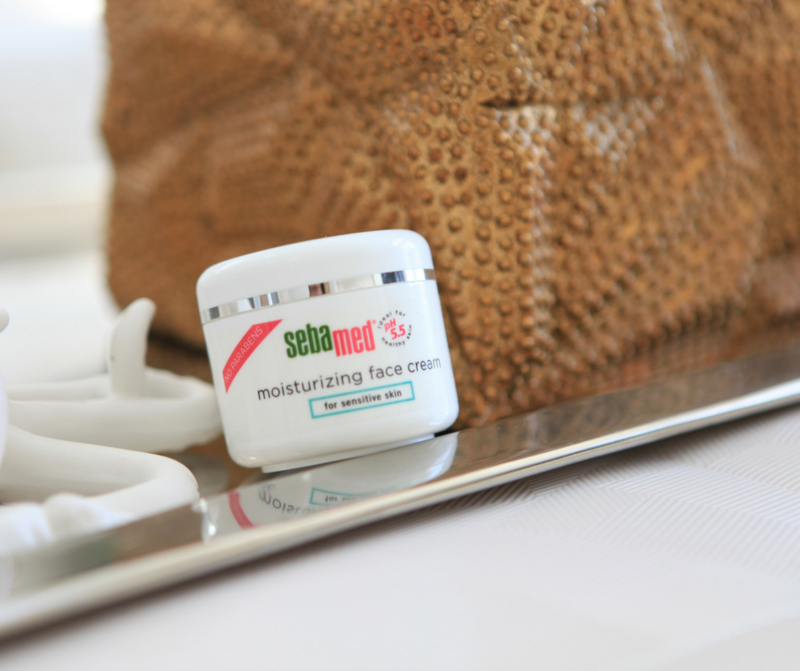 If you’re looking for holiday skin care solutions, Sebamed has you covered. We carry a wide variety of products for all skin types. Our mild formula and pH-balance allow our cleansers, moisturizers, and creams to be among the best skin care in the world. Check out our complete product lineup here. Hi Selena! Thank you so much for your kind words. 🙂 We’re glad to hear that you liked the article. We have some upcoming articles that feature tips we hope you like! Best wishes.